Please review the PHOTOGRAPHY AGREEMENT & LICENSE – TERMS AND CONDITIONS. Scheduling a real estate photography shoot indicates that you have reviewed, agree and accept TERMS & CONDITIONS detailed in the Photography Agreement & License. Please contact me for a price quote for COMMERCIAL / RENTAL / VACATION RENTAL property. Photo editing will be done for enhancement, not misrepresentation. A price will be quoted for additional advanced editing requests - such as object removal, grass enhancement (not replacement or creation). Please refer to the CODE OF ETHICS before making a request. Invoicing and image delivery are coordinated between this site and my payment system, SquareUp.com. Images are released automatically to clients who securely save their credit card online via SquareUp.com. For all other credit card clients, images are released upon receipt of the paid invoice. Square Security Information. All additional fees are detailed in the Photography Agreement & License - Terms & Conditions. Assigning rights for the duration of the listing period is a way to minimize real estate photography costs. The longer the duration of rights assigned, the higher the cost. For example, a seemingly simple portrait session can cost more than photographing an entire home. Duration and usage of image is used to determine and set terms and pricing. For most real estate photography transactions, temporary licensing is the industry standard. Images are not sold, they are licensed for the duration of the listing with the purchasing agent. This allows for a lower price point since usage is temporary compared to other types of photography. Pricing differs for real estate photography transactions that require continual usage, such as rentals. COPYRIGHT: For all photos delivered to the client for real estate sales, the copyright belongs to Debra Resch, the photographer, and licensed to be used by the realtor / agent / client for the purpose of advertising and marketing the property during the specified listing period. This license is not transferrable to any other agent or person(s) or entity. Any usage or possession by a third party is prohibited unless approved in writing by the photographer and may be subject to additional fees (or fines if done without permission). This includes but not limited to architects, builders, stagers, designers, sellers or buyers. Photos may not be edited by anyone other than the photographer or editor designated by the photographer, other than simple cropping. Please contact Debra Resch to request additional release for additional uses. Images may not be made available to another agent who takes over an expired or withdrawn listing. 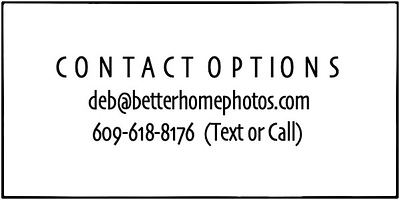 Photo Credit is to be given to Debra Resch, betterhomephotos.com, when a photo is displayed in print or social media.